“I have spent more than half of my life behind bars, and I want to make sure this will not be the same future for my children. Right now, children as young as ten are still being locked away in prisons across Australia. This year alone, around 600 children under the age of 14 were taken from their families and imprisoned. This injustice must end. ” The justice system is stacked against Aboriginal and Torres Strait Islander kids at every stage, from police through to the courts. It is undeniable that racism is a factor, whether it’s institutional or direct. It is also clear that invasion and past policies of dispossession of land, stolen children and discrimination has led to this shocking statistic, with a direct link proven between contact with the justice system and the entrenched poverty, homelessness, child removal, lack of education, family violence, substance abuse, disability, mental and other health issues. Two years after the ABC’s Four Corners program exposed horrific abuse of children in the Don Dale prison, pressure is mounting on Australian state and territory governments to raise the age of criminal responsibility from 10 to 14 years. Mr Mundine told the Council – the world’s peak human rights body of which Australia is now a member – that the Turnbull Government must stop ignoring human rights abuses at home. “I have travelled from across the world to address this Council because I want my sons to grow up in a country that treats them fairly. This one simple change to our laws, will make a very big difference. Indigenous children in Australia deserve what I was denied – equality and freedom,” said Mr Mundine. The Turnbull Government called for the Northern Territory Royal Commission into the horrors of Don Dale in 2016, but has failed to deliver a key recommendation for reform – raising the age at which children can be charged, hauled before the courts and sent to prison. Australia has one of the lowest ages of criminal responsibility in the democratic world. The average age in Europe is 14 years. 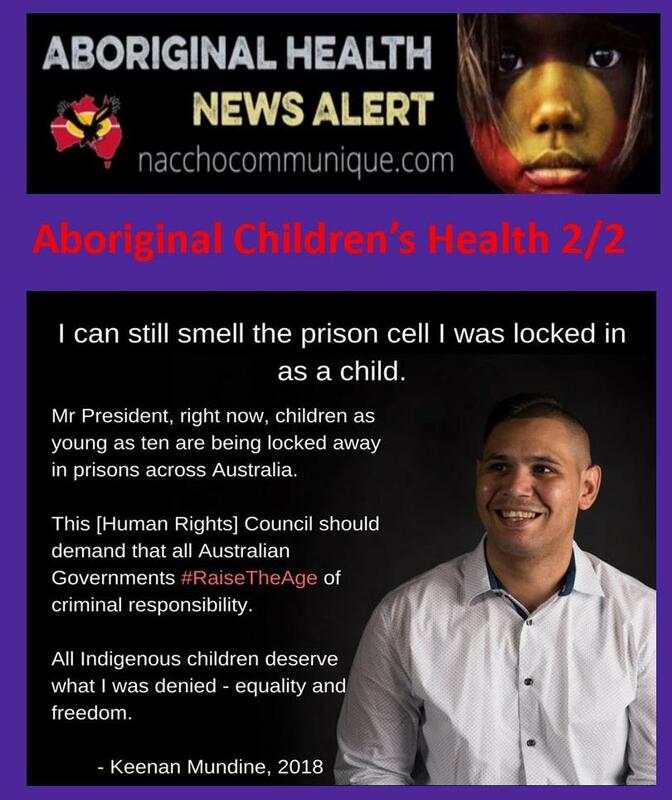 The National Aboriginal and Torres Strait Islander Legal Services, the Human Rights Law Centre, Amnesty International and other medical, Indigenous and human rights organisations have been pushing all Australian governments to commit to raising the age of criminal responsibility. Cheryl Axleby, Co-Chair of the National Aboriginal and Torres Strait Islander Legal Services, said in addition to raising the age to 14 years, more support was needed for Indigenous-led programs. “Australian youth prisons are institutional racism in action. Criminalising the behaviour of young, vulnerable children – who are mostly Aboriginal or Torres Strait Islander – creates further disadvantage and traps children in the criminal justice system. It’s time to raise the age to 14 and fund wrap-around Indigenous-led supports that keep kids strong in culture and community,” said Ms Axleby. When seeking election to the Human Rights Council, the Turnbull Government pledged to put Indigenous rights front and centre and progress the realisation of human rights through the implementation of UN recommendations and resolutions. In the last five years, the UN has demanded Australia uphold children’s rights and raise the age of criminal responsibility on numerous occasions. Ruth Barson, a Director of Legal Advocacy at the Human Rights Law Centre, said children should be in classrooms not courtrooms. “No child should be strip searched, hand cuffed, or locked in a prison cell. The Turnbull Government cannot defend human rights on the world stage, while allowing primary school aged children to be sent to prisons at home. Raising the age is a simple reform that would make a world of difference. What we need is for our governments to show some leadership,” said Ms Barson. Across Australia, Aboriginal and Torres Strait Islander children make up over 50% of the children locked away in youth prisons. Western Australia, the Northern Territory and South Australia have the highest Aboriginal and Torres Strait Islander youth imprisonment rates in the country. Belinda Lowe, Indigenous Rights Campaigner at Amnesty International, said the criminal justice system is failing kids and it’s failing communities. “Children thrive best with their families and in their communities. Let’s instead focus on prevention not detention. Let’s raise the age that kids can be put behind bars, and provide early support to children and their families who are facing difficulties in their lives, so children don’t offend in the first place,” said Ms Lowe. This session of the Human Rights Council session will run until 6 July. The Human Rights Law Centre will attend every day of the Council session and provide regular updates on the Australian Government’s actions. Every single child in prison in the Northern Territory is Indigenous. This is systemic racism in action. This damning fact is causing outrage across Australia, two years after we saw the torture and abuse coming out of Don Dale Youth Detention Centre in the nightmarish Four Corners Report. A Royal Commission followed, with hundreds of recommendations to end the over-representation of Aboriginal and Torres Strait Islander kids in prison, yet here we are. But the Northern Territory is not alone; Aboriginal and Torres Strait Islander kids are over-imprisoned in every state and territory in Australia, and are locked up at a rate 25 times higher than that of other youth. We know the reasons why, and it’s not because there are no “bad” non-Indigenous children in the Northern Territory. The justice system is stacked against Aboriginal and Torres Strait Islander kids at every stage, from police through to the courts. It is undeniable that racism is a factor, whether it’s institutional or direct. Prison doesn’t “work” – many kids come out damaged and more likely to go back in. Children need love and support and the care of their communities, so they can be brought up strong in their identity and connection with country. There is a large cross-over between experiencing child removal, disability, family violence, mental health issues, and the justice system. But families need culturally appropriate wrap-around supports in place to stay strong and together. Policies need to change to stop forced child removals, reduce family violence and help heal the ongoing trauma of the Stolen Generations. Australia is far behind the rest of the world in locking up very young children – the global median age of criminal responsibility is 14, but the Australia-wide age is 10. Science shows these young children are not yet able to understand the long-term consequences of their actions, or to control their impulses. It is often the most vulnerable and disadvantaged children who come to the attention of the justice system at a young age. Once in the system, younger children are more likely to be return to prison. Aboriginal and Torres Strait Islander kids are hugely over-represented in this age bracket, so raising the age will help to end their over-representation in the system. The NT Royal Commission recommended for government to raise the age. The UN has repeatedly criticised Australia for locking up kids as young as 10, which is below minimum international standards and recommended age, and a breach of their rights under the Convention on the Rights of the Child. 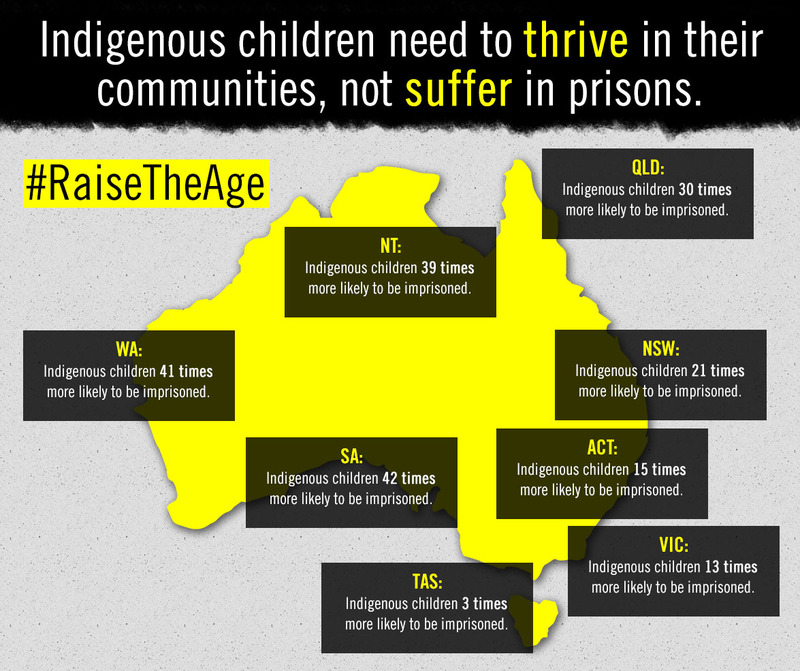 It’s time for all Australian governments to #RaisetheAge to 14. Most kids in prison are not sentenced and may not even have had their trial yet. This goes against international standards and can be incredibly damaging for kids, leading to further contact with the justice system. This can be due to police and courts not granting children bail, as well as delays in court processes and legal representation. Compliance with and over-policing of bail conditions is a huge issue for Aboriginal children, or not having a “suitable” address to be bailed to, or a guardian available to come to court. This can be fixed by having better family supports in place so bail isn’t denied due to welfare reasons, amending unfair bail legislation, increased funding and access to Aboriginal and Torres Strait Islander Legal Services, bail support programs, having custody notification services in place and investing in community alternatives to prison. Aboriginal and Torres Strait Islander Legal Services and Family Violence Legal Prevention Services are the preferred and often only option for legal representation for Aboriginal and Torres Strait Islander people. These services are community-controlled and culturally safe, and understand the systemic issues that stack the system against Indigenous people. However, these are desperately under-resourced to meet legal need, and despite the reversal of further fundings cuts in 2017, budget papers show that Aboriginal and Torres Strait Islander Legal Services will face a further $5m cut from 2020. It’s not just legal services that struggle for funding, but most Aboriginal Community-Controlled Organisations across health, disability, education, housing and youth justice diversion. In the Northern Territory, Bushmob had to end its bush camp program – where the government could have been sending kids to learn life skills and reconnect with culture, rather than to prison. Another example is Balit Ngulu – the only Aboriginal youth specific legal service in Australia – is facing closure this year due to lack of funding. Our communities have the answers but they need Government support. Whether it’s Don Dale, Cleveland, Banksia Hill, Bimberi, Parkville, Cobham – children in prisons around Australia are subject to solitary confinement, strip searches, assaults, spit hoods, hog-tying, sedating, deprivation of food, hygiene, exercise and education. These abuses are an indictment on Australia and they are continuing to happen right around the country. This year it was revealed that one young man in Banksia Hill spent over a year in isolation. Independent oversight is needed so these human rights abuses end and perpetrators are held accountable. Decades have gone by without any progress on the rates of overrepresentation of Aboriginal and Torres Strait Islander kids in prison. The Federal Government must set national justice targets on ending rates of imprisonment and violence as part of the Closing the Gap framework so it can measure, track, report and be held accountable for achieving national progress on ending the overrepresentation of Aboriginal and Torres Strait Islander children in prison. There is currently a refresh of the targets – now is the time to add them in. It is amazing how much we simply do not know about children being deprived of their liberty, because governments are either not tracking or refuse to be transparent about youth justice data. Data is necessary to inform smart and effective policy choices, and to fully understand the over-representation of Aboriginal and Torres Strait Islander kids by different age groups, genders, disability, socio-economic groups, LGBTIQ+ identity and geographic locations. The Australian Government must accept that this is a national shame which demands national leadership. The solutions are in the recommendations of the avalanche of commissions and inquiries stemming back to the Royal Commission into Aboriginal Deaths in Custody over 27 years ago. Most recently, solutions were set out in the Northern Territory Royal Commission Report and the Australian Law Reform Commission’s ‘Pathways to Justice’ Report – neither of which have received an adequate national response. The Australian Government can set minimum youth justice standards to make sure that all laws are compliant with human rights and do not disproportionately affect Indigenous kids. NATSILS, as part of Change The Record Coalition, called for these changes last year in response to the NT Royal Commission as part of a National Plan of Action. The Australian Government must hear our voices and adopt our recommendations so that our children are no longer abused in prison, and instead are supported to thrive in their communities.